At Hudson Woods, architect Drew Lang creates a modern community with a strong local flavor. The great room in the 2,800-square-foot house that architect Drew Lang designed for his family in the Hudson Woods development north of New York City features generous amounts of white oak, which he says is his favorite material. All of the wood in the house—including the oak flooring, paneling, cabinetry and stairs—comes from companies run by the Hickman company in Pennsylvania. "They have a compelling story that we were very drawn to and embraced," Lang says. "They're a fourth-generation family-owned business, and they own and manage their own FSC-certified forest. They process their own wood, mill it into flooring, and sell directly." White oak takes center stage inside the main entrance. "Our inclination from the get-go was to have a lot of wood inside the house—not just on the floors, but other surfaces," Lang says. "So as we designed, it became a matter of balancing our spaces in terms of the materials we implemented, recognizing that we weren't going to put wood everywhere. That entry space happens to be an exception where the wood is just everywhere. It is the only space in the house where wood is on the floors, the walls, the ceilings, the stairs, everywhere. Not only that, but it happens to be 16 feet high—even higher than that if you consider the opening in the stairwell—so it ended up being a really dramatic space that we're pleased with and that people are drawn to." Lang Architecture designed the simple plywood beds, set on casters, in Nico's room. A carpenter assembled them at the building site. A yellow Pedestal filing cabinet by USM is tucked under a built-in desk in the guest bedroom. The leather-back chair was designed by Michael Robbins, a furniture designer based in New York's Hudson Valley. Nico shares the downstairs bathroom with any overnight guests who may be visiting. The circular mirror, framed in white oak, was designed and made by Materia Designs, based in Kerhonkson. White oak makes a return appearance on the ceiling in the master bedroom. The master bathroom features a cedar screen and quartzite tiles by Walker Zanger. This desk was designed by William Lee, who runs a furniture store in Manhattan called Modernlink. The Langs use an outbuilding as a rec room of sorts. "We call that the Grace Studio," Lang says. "It's designed so a car can pull in there, but we use it as more of a rec room and work space." In a dense patch of forest 100 or so miles north of New York City, an unusual housing development is taking shape. When it is finished, 26 modern, gabled homes will occupy lots ranging from three to 12 acres. The houses—upscale cottages, really—will be based on one of two similar but distinct designs, each of which can be customized to suit the buyers’ tastes and, to a degree, their budget. A premium has been placed on incorporating local materials as well as promoting furnishings by area craftsmen. The development, in Kerhonkson, New York, is called Hudson Woods, and it is the brainchild of Drew Lang, a Manhattan-based architect. It evolved, he says, “out of a recognition … that going through the process of hiring an architect, buying a piece of property, and designing a house and so forth, both from a time-commitment standpoint and a financial standpoint, is not for everyone. The first house to be built—a three-bedroom, 2,800-square-foot structure outfitted with generous amounts of white oak—pulls double duty as a demonstration space for the development’s possibilities, and as a weekend retreat for Lang, his wife, Graciela, and their son Nico. 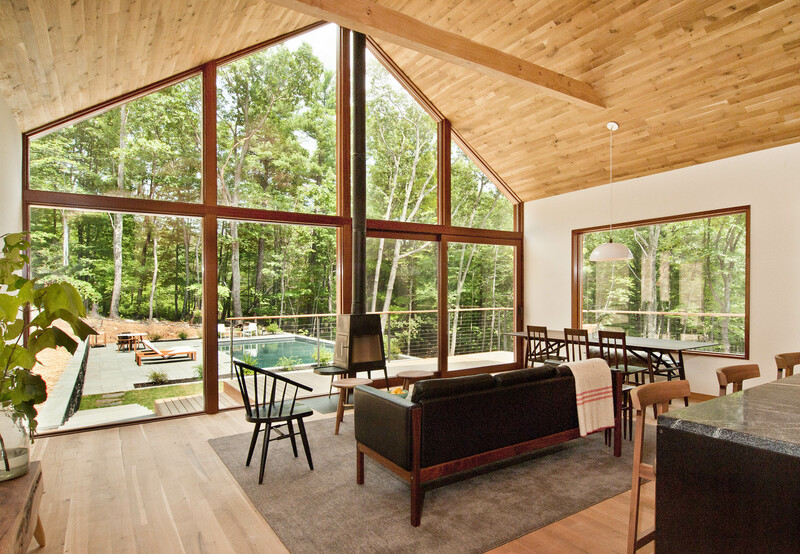 The most striking feature of this barn-like structure is a curtain wall at one end that offers an expansive view from the living room onto a porch and to the old-growth forest beyond. The shape of the house reflects a deliberate design choice, Lang says. Another way that Lang has sought to ground Hudson Woods in its surroundings is by building relationships with local craftsmen and furniture makers and promoting their work to buyers. As examples, he cited Materia Designs, based in Kerhonkson, which fashioned a circular mirror for the downstairs bathroom, and Michael Robbins, a Hudson Valley furniture designer who made a leather-back chair that sits at a desk in his guest bedroom. Lang says Hudson Woods is in the throes of “sales and construction,” with five additional house currently being built. Depending on lot size, a 2,800-square-foot “base home” at Hudson Woods sells for $665,000 to $715,000, with custom upgrades (a pool, for instance, or an extra bedroom) adding to the bottom line.